With summer fast approaching, we all have certain things that we think about. Most of us think of summer and think about roasting marshmallows by the campfire or even just having little get-togethers with friends and loved ones. Summer is a time for bonding and building memories that last a lifetime. What better way to build those fond memories than sitting around a campfire, reminiscing about old times and building new memories that will last a lifetime. What if you could enjoy these times right in your own backyard, surrounded by friends and family as you enjoy the warmth of the fire in your own fire pit? When shopping around for a new fire pit, it can feel a bit overwhelming with all of the choices out there, especially if you aren’t exactly sure what you should be looking for. When looking at fire pits, it is important to have a few key factors in mind. You first want to have an idea of the type of fire pit. Are you looking for a wood fire pit to get the full campfire experience or are you more interested in propane for a smoke-free campfire? It is also important to keep the size of the fire pit in mind. If you have a smaller yard or patio, then you may want to pick something that is more suitable. 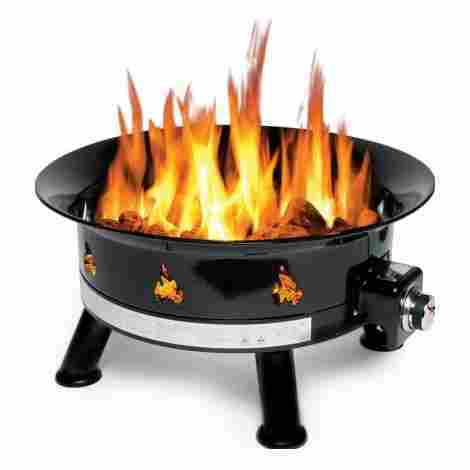 You also want to make sure that you are buying a portable fire pit if you want to take it with you when you go camping or to parties. The other important factor to keep in mind is pricing since fire pits can vary so much in pricing depending on what you are looking for. Below is a list of the top 10 patio fire pits that include all of these factors, in hopes that it will help guide you in the right direction. The Outland Firebowl Deluxe Fire Pit is a propane fire pit is the perfect solution when you are looking for a natural campfire experience without the hassle of an actual campfire. It contains a smokeless flame that burns clean, which makes you feel closer to nature without the smell of campfire on your clothes. This fire pit is CSA approved which means you can spend less times stressing and more time relaxing. It’s large in size, 24” in diameter, which is 75% bigger than the standard Outland Fire Pit, allowing for everyone to enjoy time by the fire. The burner and fasteners on this fire pit are made of stainless steel, so you know that this product will last for summers to come. It is also coated with a special powder that is made to withstand high temperatures, so you don’t have to worry about any part of this fire pit melting or chipping from getting too hot. It also cranks out at 58,000 BTU’s, so warmth will not be an issue when standing next to this pit. The Outland Deluxe Fire Pit comes with a hose that is 10 feet long and is pre-attached, which makes this both portable and convenient. There is also a regulator to help maintain consistent heat and a water-resistant cover to help ensure that this product lasts. With the overall quality of this fire pit and all of the accessories that are included, you would expect the price to be up there, but it is not. In direct comparison to other fire pits that are on this list, it is one of the least expensive ones. Don’t let the low price fool you though because this is a quality fire pit that is sure to please. The Solo Stove Patio Fire Pit is a one-of-a-kind. From its unique design to its airflow system, this fire pit aims to please. It’s made from stainless steel and is designed to maximize airflow, which aids in the burning process and limits the amount of smoke. This means that you don’t have to worry about walking around smelling like a campfire the entire time, which is something that I think we all can appreciate. This fire pit has a special wall design with vent holes in the bottom of the pit that allows the air to flow from the bottom up. This keeps the fire burning longer, which means that you get to spend more time relaxing by the fire and less time maintaining it. 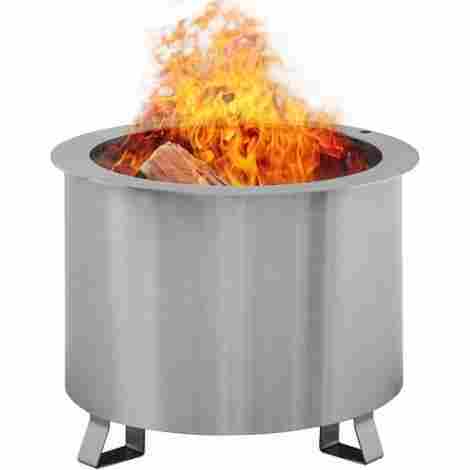 It is also made from a strong stainless steel, so you know that this fire pit was built to last. 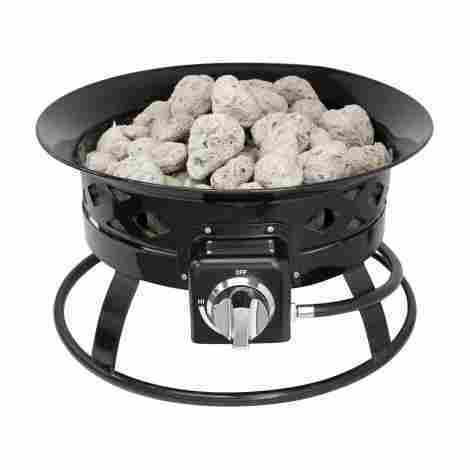 The Solo Stove Fire Pit is actually just a single unit, so there is no assembly required, so there are not a lot of accessories included. It does come with its own carrying case, so it is portable and convenient. Compared to the other fire pits on this list, this is one of the more expensive ones. Don’t let the price of this fire pit steer you in the wrong direction. From its unique airflow design and the fact that this was built from a strong steel, you can rest assured that your money is not going to waste. The Heininger Portable Fire Pit is the way to go if you have no desire to mess with firewood. It uses propane, which means that you get to enjoy the luxury of a campfire without the hassle of hauling wood around. It also burns cleaner, so you don’t have to worry about the smell of the campfire getting in your hair and on your clothes. With it being only 19” in diameter, it is perfect for taking it to parties, camping, and even tailgating. This propane fire pit cranks out 58,000 BTU’s and was designed with ease and convenience in mind. It is lightweight in nature and is easy to set up. Its unique design allows for the maximum visual experience of a campfire without the smoke and constant trips to get firewood. The Heininger fire pit requires little set up, which is good news because it means less time that you have to spend packing and hauling it around. This fire pit does come with its own hose to hook up to the propane tank and it also comes with lava rocks, so you can experience the full effects of the campfire without the fuss. Out of all of the fire pits on this list, this is probably one of the least expensive ones. Even though this may be one of the least expensive ones, the price does not speak for the quality. Since this is made from quality materials and does come with some accessories, you are getting a steal of a deal with this fire pit. If you are looking for a fire pit that is more on the stylish side, then the Landmann Big Sky Fire Pit is a perfect choice. This fire pit is made from quality steel and has leaves engraved around the entire pit, which is perfect for a romantic night next to the campfire with a loved one. 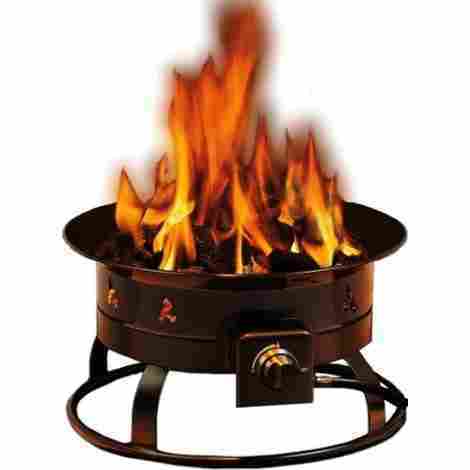 This easy to assemble fire pit functions as a grill as well, which basically means that you are getting two products wrapped in one. This Landmann fire pit has a unique design that stands out from the rest. 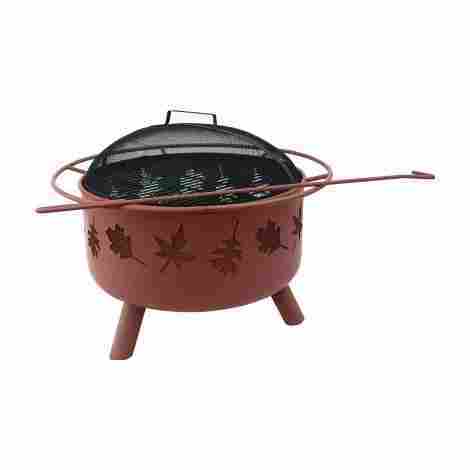 This steel fire pit has beautiful leaves engraved along the outer base, which makes for gorgeous scenery. At 23 inches in diameter and 12.5 inches deep, the low profile allows for a full view of the fire no matter where you are sitting. This fire pit was not only designed with the luxury of campfires in mind, but it was designed with grilling in mind as well. It comes with a cooking grate, so you can cook up those delicious hamburgers and hot dogs we have all grown to love. It also comes with a fire poker and a cover to help shield sparks and wind. The Landmann Big Sky Fire Pit is actually one of the less expensive fire pits on this list. In comparison to other fire pits, this one has twice the functionality and comes with multiple accessories, so you know that you are getting more than your money’s worth with this product. The Catalina Creations Fire Pit us a heavy duty fire pit that is made from cast iron, which speaks for the durability of this product. The base of this fire pit is reinforced with a thicker gauge of steel, which means that this is a fire pit that will last for many years to come. Just the fact that this is a cast iron fire pit speaks volumes about how durable this product is. This fire pit was designed for larger fires in mind. 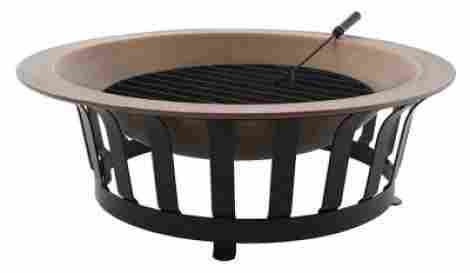 The deep bowl is 24 inches in diameter and has a spark screen that helps protect against fly away embers. With the larger fire pit, you can entertain more people at once and no one will feel left out. The Catalina Creations Fire Pit comes with a cover that helps protect the fire pit from the elements. It also comes with a mesh screen that is removable. The screen helps keep the hot embers at bay, so you don’t have to worry about getting burned. It is easily removable so you can access the flames to roast marshmallows that we have all grown to love. It also comes with a handy lifting tool that lifts the screen off so you don’t have to worry about burning your hands. Compared to other fire pits on this list, the Catalina Creations fire pit is right in the middle as far as pricing. Considering that this fire pit is made from solid cast iron and comes with accessories, you really can’t go wrong with this choice. The Double Flame Patio Fire Pit is made with stainless steel walls that actually get hot and release all of the hot air through the holes that are strategically placed along the rim of the fire pit. This allows for minimal smoke, so you can rest assure that relaxing by the fire will not cause your hair and clothes to smell. This durable design also prevents rusting and corrosion, so you won’t feel like you have wasted your money and will get the maximum use out of this fire pit. This fire pit was built with stainless steel walls that are double the thickness of other brands. This heavy-duty material can withstand the harshest of weather conditions, which means you can enjoy the campfire experience with this fire pit for years to come. Although this fire pit has unique qualities, it does not come with any accessories. It does, however, give you the option of purchasing a swing away grill that comes with a post that is adjustable that has a handle that is heat resistant. In comparison to other fire pits on this list, this is one of the more expensive ones. Don’t let the price of this fire pit scare you though, because of the unique design and durable materials that this product is made with, it is worth every penny. 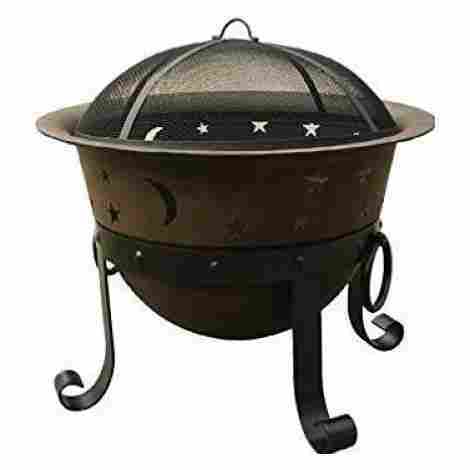 This fire pit is the perfect choice if you are looking for a heavy duty, solid fire pit. Weighing 66 pounds, this solid copper fire pit is sure to last summer after summer. It was also built for larger fires, so you can fit up to 2 foot long logs. Which means less firewood to cut up and haul around. Since it is for larger fires, you can also have larger groups of people and no one will complain about being cold or disappointed. The Titan Copper Fire Pit is made from 100% copper and has an iron base that only adds to its stability and durability. It is also coated with a special powder that helps prevent corrosion. This means that you get to enjoy this fire pit year after year. Unfortunately, this fire pit does not include any accessories, but it does give you the option of purchasing a fire pit cover separately. In comparison to the other fire pits on this list, this is one of the more expensive ones. Given the fact that it is made out of solid copper and the overall size of this fire pit, I would say that it is worth every penny spent. The Sunward Portable Fire Pit is a propane fire pit that is lightweight and compact. Since this fire pit runs off of propane, it is smoke-free, which means that you don’t have to worry about walking around smelling like a campfire the whole time. It is also safe to cook over, so get ready for some deliciously gooey S’mores! This propane fire pit cranks out at 58,000 BTU’s, which means you don’t have to worry about freezing on those cool nights. It is made from solid steel and contains a stainless steel burner, so you can bet that this fire pit is built to last. The Sunward Fire Pit comes with a whole array of accessories. It includes a gas line (10 feet) with a regulator to adjust the flame. It also comes with a weather resistant carrying bag and a propane tank holder. When you compare all of this fire pits features and accessories to others on this list, you would probably expect to pay more for this fire pit. That is not the case with the Sunward Fire Pit. In comparison to the pricing on other fire pits, this one is right in the middle which makes every penny you spend on it completely worth it. The Sunnydaze Fire Pit is the perfect size for those summer get-togethers that we all like to occasionally have. It is 36 inches in diameter and 12 inches deep, which makes this the perfect size to take with no matter where you go. It comes with minimal parts, so it is easy to assemble and makes setting up a breeze. This fire pit is a must-have essential for summer fires. It is made from a durable steel and contains a special paint that is made to withstand high temperatures, so you don’t have to worry about corrosion or the paint peeling from the extreme, constant heat. This fire pit is also backed by a 1-year manufacturer warranty, so you really can’t go wrong. The Sunnydaze Fire Pit comes with a spark screen so you don’t have to worry about those hot embers landing on you. It also comes with a tool that functions both as a fire poker and a screen lifter, so you don’t have to worry about burning your hands trying to remove the screen when you are ready to cook. If that isn’t enough to catch your attention, then the free weather resistant cover will. It is designed to withstand moisture, so your fire pit can last for years to come. 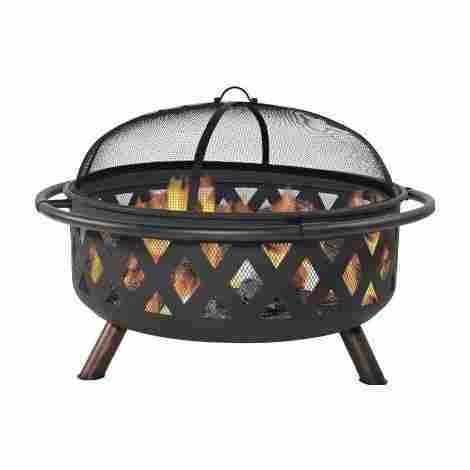 Comparing this fire pit to others on this list, this falls in the average range for pricing. Considering all of this fire pits features and all of the accessories that come along with it, you are getting an amazing deal that won’t break the bank. The Legacy Fire Table is a unique type of fire pit. It is built like a table with storage space, so it looks like a piece of patio furniture, but it functions as a fire pit. This solid steel propane fire pit cranks out 48,000 BTU’s and is ETL approved. It has a special mocha powder coating that helps protect it from wear and tear from heat and the weather. This sturdy, solid steel fire table brings a whole new meaning to the word, chic. Its unique design is perfect for those who are looking for a fire pit that blends in with the rest of their patio furniture. The Legacy is equipped with a stainless steel burner and has an easily accessible door for the propane tank, which holds the standard 20 lb tank. Since this fire table is a solid piece of furniture, it does not come with many accessories. It does, however, come with a lid cover as well as lava rocks, to give you that true campfire experience right on your patio in your own backyard. Considering the unique design of this fire table and its features, it would be safe to assume that this would be on the higher end of pricing. That is not the case with the Legacy Fire Table. In comparison to other fire pits on this list, it falls in the average price range, which makes this a steal of a deal. Choosing the right fire pit is really a personal choice. It depends on what type of fire pit you are looking for, the overall functionality of the fire pit, and of course your budget. The purpose of this list was to help take some of the stress off of your shoulders and allow you to view the different aspects when shopping for a new fire pit. After all, the whole point of buying a fire pit is to enjoy some rest and relaxation with friends and family. As long as you keep all of your wants and needs in mind, finding the perfect fire pit should be a breeze. So, take a deep breath and happy shopping! One of the first aspects we considered when researching the best propane fire pits was their BTU ( British Thermal Unit ) output. This is essentially the measurement of its heating capabilities. A higher BTU on a fire pit will give it a further area of effect. Additionally the BTU output will help you to estimate fuel usage. A higher BTU output requires more fuel. In an attempt to provide the best selection we chose fire pits with both lower and higher BTU outputs. A great way to enhance the fire pit experience is the use of lava rocks. This small addition provides a great ambiance and with a small variety of different colors and styles there is a lava rock for every occasion. Many of the fire pits featured in this list have an area to hold some of these rocks and even include them with your purchase. You may not be looking for a burning man sized flame but a larger flame has a way of pulling you in and can be quite entrancing. Regarding the wood burning fire pits we tried to include those that had a larger capacity for those nights you want a larger fire. Going larger was the better option as a larger fire pit can easily contain a smaller fire however a smaller fire pit is limited to smaller fires. Some of these fire pits were designed with a dual purpose in mind. One example is the fire pit that includes a grill grate. This multi functional aspect is a great way to add a hint of earth tones to your food. Another example is the the patio fire pit table. When not in use it appears to be your standard piece of patio furniture. Any fire pit that utilized this dual purpose trait had a slightly higher value than those that did not. As an added layer of protection most fire pits use a spark screen. This is a woven mesh screen that works to prevent embers and sparks from flying out of the pit. This safety measure could prove to be invaluable and potentially prevent an accidental fire giving any fire pit that uses one a higher value that others that don’t. With temperatures from a wood fire being capable of reaching up to 1100 degrees fahrenheit the material used to produce these fire pits needs to be capable of withstanding this excessive heat. Most of the wood burning fire pits we selected used steel that is assisted by a high-temperature powder coating. This allows for a steel that can withstand a heat of up to 1500 degrees fahrenheit. Another fire pit used copper alternatively. Copper is able to withstand heat up to 1900 degrees fahrenheit making it a great choice for fire pits. Whether you’re simply cleaning your patio or want to bring that fire pit you love to another location, portability was another trait we sought to include in this list. The propane based fire pits are mostly quite small and can be easily moved. The wood burning fire pits however were more assorted in size and while the larger fire pits can be moved they can be rather heavy. The more portable fire pits were placed higher than those that would be more difficult to move. The fuel source you use to feed your fire comes with their own set of unique advantages and disadvantages. Propane fire pits produce a clean and nearly smoke free type of flame that leaves no waste. Associated with this however is the price of propane and the longer you use one the more expensive your fire pit becomes to operate. Wood fires have a very natural feeling and embody those lovely smells you associate with a cool summer night. Wood fires generate waste which will need to be removed. At the end of the day it boils down to your preference and we’ve included both on this list. As fire pits can be potentially dangerous they have some industry standards in place that help to keep their use relatively safe. Two groups particularly, the American National Standards Institute ( ANSI ) and the Canadian Standards Association ( CSA ) worked together to publish the CSA 2.41-2014/ANSI Z21.97-2014 gas appliance standards. 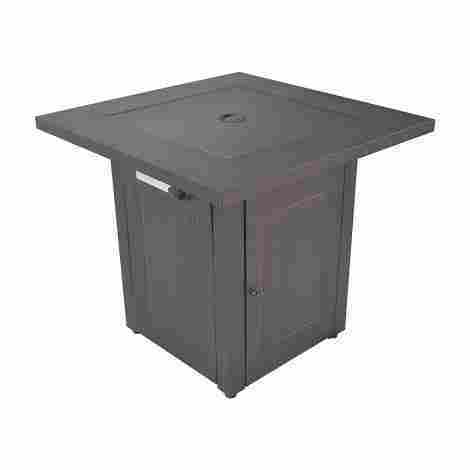 It ensures a fire pit has been tested by a laboratory to meet minimum standards concerning safety. Some of the fire pits on this list are CSA/ANSI approved and maintain these minimum safety standards. Wood fire pits do require a bit of care and management should you want to maintain your fire. Wood piles will collapse and crumble breaking away and spreading the wood pile you worked hard to prop up. One of the best ways to maintain a longer fire is to use a simple tool, the fire poker. Fire pokers have roots as early as 10,000 B.C however this tool was first mass produced around the year 1898. Any fire pit that included this tool has a higher value and as such earned a higher positioning on this best of list. Wood fire pits can generally produce a substantial amount of residual waste. Over the course of a season this waste can be difficult to work around and cleaning it can quickly become a hassle. One of the more common features on the wood burning fire pits is an under plate that can be removed to allow for easier ash removal and will help you to clean your fire pit. Some of the featured fire pits we selected use this feature and will be much easier to clean that those that don’t. When selecting these patio fire pits a key aspect was ensuring they were an above and off the ground option. This is to ensure that your patio remains untarnished through the use of your fire pit and it isn’t exposed to excessive heat. Aside from two unique fire pits all of the other fire pits are above the ground to varying degrees. Being that most fire pits are made out of metal they can become extremely hot. This heat caused by your fire can and will radiate through the entire pit and can burn your flesh should you come in contact with it. Some of the better quality fire pits us an insulation layer between the interior metal and exterior metal in an attempt to mitigate some of the intense heat. This safety feature is a very welcome addition to a couple of the fire pits we chose for this list. Aside from the original purchase and regardless of whether or not you use wood or propane there is generally an additional upkeep or fueling cost associated with a fire pit. In this case it is the cost of your fuel of choice. Wood or propane you will likely need to purchase the fuel and each time you do so the operational cost increases. When researching these fire pits we attempted to select those that had a lower operational cost but performed well regardless. When organizing this list another trait that helped to quantify their values was the addition of any unique features that other fire pits didn’t possess. In one instance a wood fire pit featured outdoor themed cut out accents that provides an aesthetically pleasing appearance and helps to amplify the ambiance. In another instance a fire pit included both a mesh spark screen and a fire poker. These unique features help to increase the fire pits value and ensure a satisfying purchase. The simple design used to produce these fire pits leaves little room for damaging. Generally the greatest threat to these fire pits are the elements. The best way to combat this natural adversary is a fire pit cover. This small be essential amenity will keep the elements off your fire pit and help to ensure a longer lasting product. Many of the fire pits we selected included a fire pit cover or have one available for additional purchase. Perfection is meant to be an unattainable quality that can be strived for but never reached. Contrary to this concept perfection can become a process rather than a quality. Many of these fire pits are produced by manufacturers that offer warranties with limited or lifetime assurances. 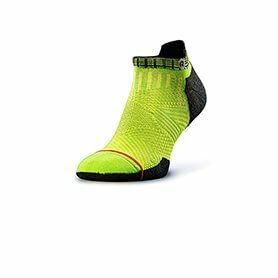 These do vary from product to product and you will need to check the product you’re interested in for more information. Part of what makes a great product is a great price tag. This doesn’t necessarily have to mean it will be inexpensive as long as the features and functionality accompanying the price tag are balanced. When making this list we tried to compare the prices and value amongst these products and organize them based on the outcome of this analysis. Q: How much propane do these gas fire pits burn? A: The amount of fuel that these propane fire pits burns is relative to their BTU ( British Thermal Unit ) output. Additionally if there is a controlling knob that allows you to adjust the flow you can moderate the consumption to some degree. As a general rule the higher the BTU output the more fuel you will consume. Q: How can you clean these fire pits? A: Most of these fire pits use a simple bucket design and will require you to scoop out the waste left behind from a wood fire. Some of the products do have a lower plate that will allow you to drop the waste into a bucket making cleaning easier. Q: Can these fire pits be used on a covered patio? A: While this will depending on the height of your patio covering, some of the smaller propane fire pits should be ok. Any of the larger fire pits would be more concerning and I would highly recommend use on an open outdoor style patio that wasn’t covered. Q: Can I add sand to these fire pits? A: Adding sand to the propane fire pits would not work well however the wood fire pits can accommodate a base layer of sand for that added protection you’re looking for. Q: Will these rust if left out in the rain? A: Rusting occurs when iron, oxygen, and water combine so when iron or an alloy like steel that contains iron is exposed for a long period of time you will definitely experience rusting. The simplest way to prevent rusting is a fire pit cover. Q: Will the copper fire pit suffer discoloration? A: Much like the statue of liberty over time this copper will develop a patina and discolor over time. This patina can be washed off and regular polishing will prevent its development. Q: Is the flame adjustable on the propane fire pits? A: All of the propane fire pits on this list use a turning knob that will adjust the flow of propane to the pit. 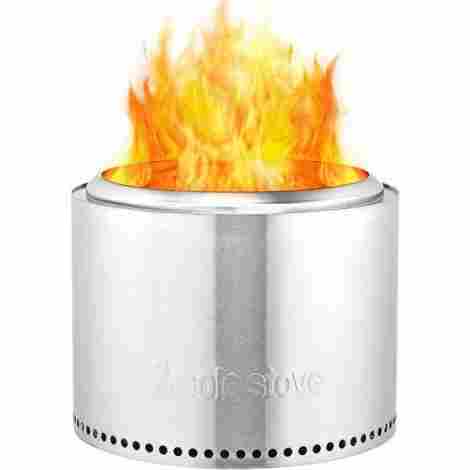 This will in turn increase or decrease the flame, so yes, the flame is adjustable. Q: Can I add a cooking grate to these fit pits? A: While some of the fire pits on this grill come with a cooking grate with the purchase others aren’t so accommodating. While you could likely manufacture your own cooking grate and adhere it to your fire pit, this isn’t the intended purpose on some models and may be difficult to accomplish.